Leviim חניכים (campers) were sad to leave the beautiful White mountains after an amazing couple days of hiking, eating s’mores, and bonding as an עדה(age group). We returned Thursday afternoon just in time for ארוכת צוהריים (lunch) and ready to bounce back into daily camp life!! After getting settled back in their צריפים Leviim בנות(girls) went to אומנות(art) to make beaded bracelets of their own design while the בנים (boys) learned how to play “SpikeBall” a new game involving a mini trampoline and partners bouncing a ball to one another. 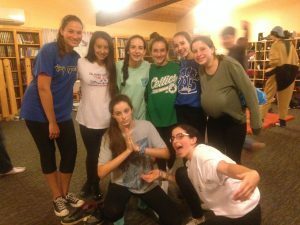 Thursday night בנות participated in “Leviim’s Got Tale nt” or a mini talent show, which inevitably turned into a giant dance party, while the בנים met with Rabbi Isiah and had a very deep conversation about relationships, bunk dynamics, and becoming teenagers. After another regular morning of swimming in the אגם(lake), attending חוגים(electives), and learning in כיתה (class), several campers played in a volleyball tournament with other nearby Jewish camps, and then it was finally time for our second שבת of the קיץ (summer)!!! Despite the overcast sky, our חניכים were beyond excited to welcome in Shabbat with relish (Ruach lifnei Shabbat), as the whole camp gathered for תפילות (prayers). After a delicious Shabbat meal, the חניכים sang זמירות (songs) arm and arm with the entire camp. On Saturday our campers enjoyed their free time together, hanging out in the bunk away from the rain, reading, and having meaningful conversations about their summer so far. Additionally, all of Leviim was thrilled to celebrate our חניך Noam’s birthday with cake and singing!! Sunday our חניכים all came together to start practicing for Zimriyah (the all camp singing competition and most exciting day of the summer). The campers were so thrilled to start learning their songs, as many of them had been asking since day one when we would start!!! They already sound beautiful and we the מדריכים could not be more excited or proud. Afterwards בנים played soccer together while the בנות did some amazing Zumba. Sunday evening Kerem (the oldest campers and CITs) led a פעולת ערב(evening activity) titled “Sumo Wrestling” during which campers were given a balloon under an over sized shirt and had to pop other חניכים balloons!! The חניכים loved the activity and getting to spend time with their Kerem who they clearly look up to as leaders.